Name 3 things sitting next to you right now. I’m in the lab I work at as I type this. So beside me we have….someone’s old, empty can of coke, my cellphone, and a microscope that’s worth more than anything I own. everything I own. combined. Riveting stuff. Name 2 foods you can’t live without – Ice cream. I only need one food to survive. Name 2 people you can’t live without- Tom Hanks and Wilson the volleyball. Name 1 thing you did today – I spent my day in a lab. Roughly translated, this means no one wants to hear the details of anything I did. 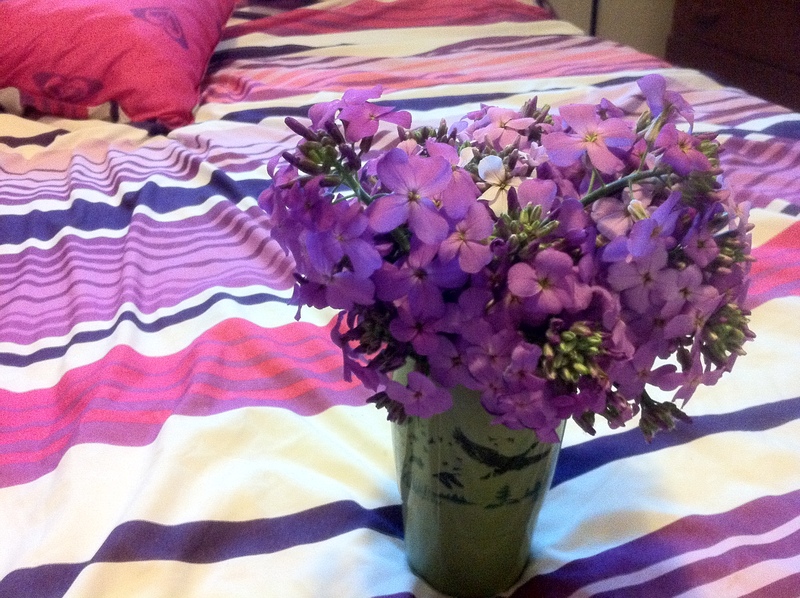 However, upon grouchily returning home after a Saturday at school, my not so secret admirer had this waiting for me……. which slightly lessened the blow of going to school all weekend. Name 2 things you learned from the healthy blogging community – 1. putting spinach in your smoothies will be the best decision you ever make 2. Experiment with recipes. you will surprise yourself. I’ve just received word that a new frozen yogurt shop opened in my neighbourhood. Allegedly they sell cake batter frozen yogurt. This is my cue to run to that store immediately. What’s your favourite flavour of frozen yogurt? I’ve never found a place that sold cake batter before so I am beeeeeeeyond excited! Okay this is coming from the overnight oats expert. Make your serving of oats the night before in the microwave. Dont use a lot of water because you want them to be nice and thick. Then add milk and sweetener of choice. I make 1.5 cups of oats, add 3/4 cup of milk, cinnamon, and throw in a scoop of protein powder (my protein powder is really sweet), but you could add maple syrup, chopped up fruit, sugar, etc. to make it sweet. My favorite add-ins are bananas, almonds, peanut butter, and grated zucchini. Totally just realized I posted this in the wrong post section lol. oops. Alright I am seriously jealous that you have a frozen yogurt place nearby!!! We have none here that sell that kind of froyo in Windsor 😦 blah. Oh aaaaand you’re hilarious. WILSONNNN!! That’s pretty funny because I got cake batter and pistachio together! Cake batter fro yo ?? Whaaa. What’s this place called?? ?